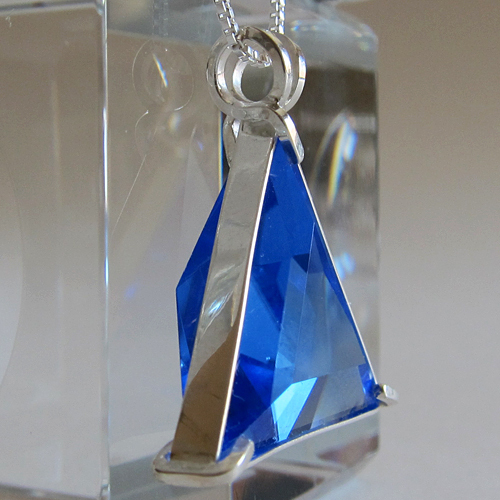 Dimensions (HxWxD): 1.25" x 1" x 0.25"
This gorgeous rich Cobalt Blue Siberian Quartz Vogel cut Star of David crystal pendant is of exceptional quality, both in the cut of the stone and in the elegant sterling silver setting which allows the stone to breathe and function at its highest vibration. It comes with a sterling silver chain which sits upon the thymus where it can resonate through the compassionate heart. Our jeweler recommended Siberian Blue Quartz to Jane and me, and although we normally do not sell laboratory grown quartz, we decided to trust his experience and his crystal wisdom, born of many years of experience as a Lightworker and crystal cutter. 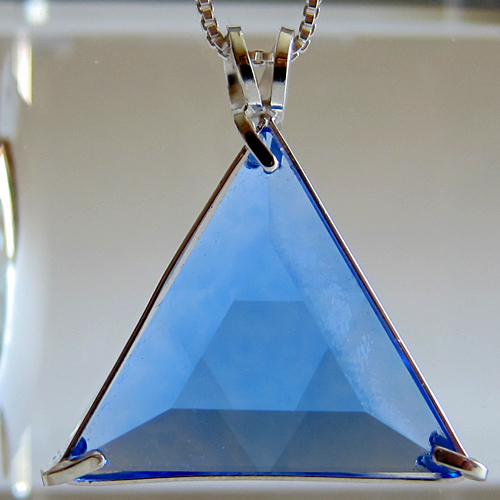 The Star of David cut crystal was invented by IBM scientist and energy healer Marcel Vogel. He invented the coating on computer hard drives that holds the memory. He was also a renowned energy healer who created precision cut crystals intuitively, according to the principles of sacred geometry, for healing and meditation purposes. 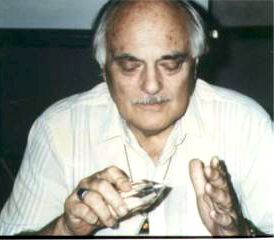 Marcel, a Lightworker who performed crystal healings on others, always wore a Star of David for protection. This Vogel Star of David, is composed of two triangles, one pointed up and the other down, makes use of a symbol that has been used for millenia and represents the merging of the higher and lower worlds, enabling us to connect to the Divine on our path of spiritual evolution. The Star of David is a versatile Lightworker's power tool that serves as a receiver, amplifier and transmitter of Universal Life Force energies and strengthens the bearer's bio-field, or aura. The front face is the male face, and it transmits light energy. The back face is the female face, and it receives light energy. This way, the female, receptive side of the crystal will pick up the energy coming from your heart, the amethyst will transmute that energy into a very high frequency vibration, and the male side of the crystal will radiate that high frequency light energy in all directions around you, enveloping you and filling your aura with the cleansing, healing energy. This strengthens your aura and helps protect your from unwanted, intrusive energies of all kinds in your environment. The female side of the crystal will pick up the subtle energies from the flower essences, the crystal will amplify theat energy, and combine that healing energy with the energy of the violet ray. Then the male side will radiate that energy through the male side of the crystal into the affected area. This crystal has been cleaned and charged with Universal Life Force Energy, and given an energetic attunement using Reiki, a Japanese technique of energy healing so it will continue to channel and transmit Universal Life Force Energy direct from the Source of Creation. It is ready for you to program according to your own needs and desires. Note: Weight above is shipping weight. Net weight is .35 oz. or 9.9 grams. Each piece is unique and may vary slightly in appearance. Each piece is guaranteed to be beautiful and to meet with your complete satisfaction!